Nils Olav Bøe goes about making his artworks in a similar way to the process of making stage scenery; he spends a lot of time working out the concept and envisaging how the pictures are to appear when finished. He selects props for the scenes he creates either from objects he makes himself or from model shops, usually figures designed for model railways to the scale of 1:87. First he makes sketches and then detailed drawings of the scenes; once the final touches have been made to the set, the pictures can be taken. He gives the scene a paper background and designs the lighting so that it resembles natural, outdoor light as much as possible. Bøe uses mirrors to light certain objects, for example street lamps that would appear too bright if fitted with light bulbs. We are brought up to believe in photography as a reproduction of reality; a picture is from a particular place with houses, streets and landmarks. Like post cards of the Eiffel Tower, the Colosseum or the Twin Towers. Places are authentic and unchangeable. A place is rooted in personal experience, almost as strongly as a personality trait. Places evoke strong expectations of permanence in us. If a place changes, revisiting it after many years can be agonizing. When Nils Olav B¯e portrays idyllic landscapes in the form of small models, he challenges traditional ideas by presenting the observer with a set - a staged scene that is at once real and unreal. A physical place is located by map references, which pinpoint the location to the nearest metre. The scale indicates the degree of miniaturisation and contour lines indicate its relationship to neighbouring places. A place can be described as steep, flat, low etc. and can also be determined by GPS, so that you can locate a place you have been to or find a place you are going to. Vegetation is a feature of a place but is just as irrelevant to it as whether the place has a name or not, or whether we like it or not. A place changes when we build on it; Ground Zero is fundamentally different from the Twin Towers, even though they refer to the same place. A place is first and foremost defined by its history, and our experience of it is a very personal matter. One and the same scene has one meaning for the perpetrator, another for the victim, and yet another for the viewer. Nils Olav Bøe's photographs evoke a feeling of being at or near the scene of a crime; something has happened or is about to happen. Here, or close by. 'If you take away the colours, you erase time even more', says Nils Olav Bøe. 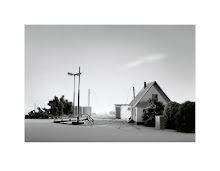 And his photographs (from the series Constructed Landscapes) are an expression of this; it is difficult to pinpoint a "before" and an "after", so that what you see in the photographs could be in the recent past or in the near future. Due to Nils Olav Bøe's stringent staging, time does not seem to elapse in its usual linear and chronological way. The moment becomes an inner process and is drawn out in the process. Time does not stand still but enters a dormant or slow motion state, in which the scene challenges the observer to reflect on what she is seeing. The pictures offer no cut-and-dried solutions but are open to subjective interpretation based on the observer's own associations. The serial nature of Bøe's works is reminiscent of movie stills, and they mimic reality as it appears when you look out of the window of a car at speed. They remind us first and foremost of movies and film directors such as Lynch, Tarkovsky and Tarantino who are known for creating films with ambiguous scenes. The tense atmosphere that Nils Olav Bøe creates in his works echoes ambiguous and partly threatening scenes of this kind. The dramatic build-up and lighting evoke an aura of doom and criticism of civilisation; a sense of alienation that might be caused by technology, or more frighteningly, by nature itself. In short: a staged reality and threatening idyll. Henning L. Mortensen, extract from the magazine Art, Oslo 2005.